By now you may be thinking to yourself, "What, she just goes out and sees celebrities all the time?" Saturday, while at lunch at Malawi's, out of the corner of my eye I saw someone walking past our booth toward the register. Immediately, I hissed, "YOUGUYS," and gave a brief nod to the area behind me. Wendy saw it and said, "Lisa. Look." Shannon looked over, too. "Is that . . . ?" "Yep." I got up to refill my drink and thought, 'I should say something to him. Perhaps an obscure B98.7 reference.' Yes, that would do. At precisely the time I walked back to my booth, my path crossed with Donny's. "Oh, hey," I said, gaining his attention, "it's the guy from the radio." He smiled as he was being escorted by an eager devotee to a table filled with enthusiastic lady fans. I sat down and Wendy mused, "It's because of YOU! That's why we saw him! You're learning your lesson after Ty Burrell." She was right. I mean, in my mind. Yes, The Universe was apologizing for my non-encounter with Ty Burrell, and so The Universe brought me: Donny Osmond. I watched as he finished with the near-hysterical-but-totally-keeping-it-cool ladies, and could see that he was on his way out. I watched his face until his eyes met mine. "Hi, would you mind if we just took a quick picture, Sir?" I called him SIR. What the. "Sure, no problem," he smiled. As I stood and Wendy readied her camera-phone, I whispered, "Thank you so much, you're really great. My name is Jenny, and I'm happy to meet you." "It's nice to meet you, Jenny." "Thank you, Ladies. Have a nice day." This: "She was right. I mean, in my mind. 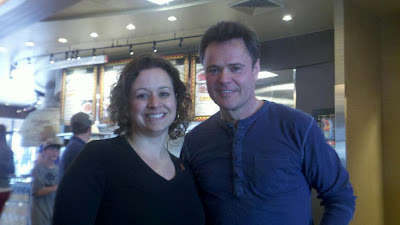 Yes, The Universe was apologizing for my non-encounter with Ty Burrell, and so The Universe brought me: Donny Osmond." Call me crazy, but I thought he would have been a good replacement for Bob Barker. A little more exciting than Drew Carey. That's what I'll tell him if The Universe brings him to me. Vern - thank you! I didn't say anything to Elder Archuleta on Saturday. My bad. cari - Seriously. What the. Emily - It's the only reasoning I can come up with. ray-ray - you are BRILLIANT. He would be perfect for that gig! Jen - what did he buy at Costco? I really want to know. Ken - I see your singing, and raise you backup lyrics and a dance.